As globalization brings new medical challenges to the United States, planning and preparedness must take on a higher priority in the public health field. While public health is facing reduced funding throughout the U.S. government, some national member organizations have kept planning and preparedness in the spotlight and acknowledge those public health organizations that have anticipated the next threat. The Zika virus has gained recent recognition as an international threat, with many calls for the World Health Organization (WHO) to mount a coordinated response. The virus’ suspected link to birth defects and other diseases has led to travel advisories and precautionary policies, including advising women in countries like El Salvador to delay pregnancy. The WHO convened a meeting and declared Zika a public health emergency. Meanwhile, in the U.S., federal authorities have previously indicated they did not foresee new Zika infections occurring in the U.S. However, with a case of Zika linked to sexual transmission and 36 people in the U.S. believed to have been infected while traveling, the U.S. must take a proactive stance. One can already see this with the governor of Florida declaring a public health emergency in counties affected by Zika. Just as the WHO must begin coordinating resources with its members to stop Zika’s spread, America’s public health sector must again start strategizing for how national, state and local resources can best be coordinated. The response to Zika highlights the importance of ongoing public health planning, preparedness and response efforts in the U.S. This takes on greater importance when one considers threats like Zika may not just require a temporary surge, but ongoing management. The National Association of City and County Health Officials (NACCHO) has been incentivizing the institutionalization of planning, preparedness and response work by recognizing health departments and jurisdictions that have met best practice standards through the Public Health Ready program. The plans local health departments have to submit to receive this recognition encompass consideration of numerous criteria, including legal and administrative preparedness, community preparedness and recovery. Legal and administrative preparedness includes the efficient accepting, allocating and spending of funds from different sources. Public health preparedness, particularly collaborative endeavors, has become dependent on grant funding from a variety of federal sources, making grant management an important skill. 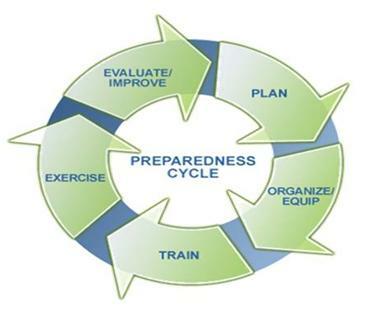 Community preparedness encompasses the need to have knowledge of, and collaboration with, vulnerable and underserved populations in the community. The work of Lawrence Gostin and others has long highlighted the need to incorporate ethical considerations into public health policy. This should include not only accounting for the needs of vulnerable populations, but also allowing them to have meaningful input into planning and preparedness efforts. Another criterion emphasized by the Public Health Ready program is community recovery. Planning in this area should include consideration of short- and long-term recovery goals, an assessment of what resources will be needed to meet those goals, as well as an assessment of what resources are readily available in the jurisdiction. A plan needs to be in place to rebuild essential health services, as public health emergencies can affect health providers and degrade existing capabilities. Multi-organization collaboration can be essential, as departments may develop agreements regarding such issues as sharing personnel. Communication among members of this collaborative, as well as with the public at large, will be vital to response and recovery efforts. Public health collaborative organizations should maintain and regularly test communication systems, which will allow them to share updated information quickly and efficiently during a crisis. The timing of response actions should be clearly mapped out and it should be understood who holds the legal authority to undertake those actions. All such actions should be carefully documented so as to accurately track the response. Recovery from a major public health crisis in a community may take time, but having clear plans in place beforehand, as well as the means to systematically implement them, should help to allay public concern and avoid an erosion of public trust. Regardless of how severe the effects of Zika ultimately turn out to be, its emergence illustrates that more attention to public health preparedness, planning and response in the U.S. is needed. This is particularly true when one takes into account the views expressed in a recent Foreign Policy article by Laurie Garrett, which suggests that Zika may not represent an emerging epidemic, but rather an endemic threat. A temporary surge may not be enough; public health organizations may need to prepare to manage it over a long period. Such a prospect makes it all the more imperative that more U.S. public health organizations develop the capabilities in the Public Health Ready criteria, particularly effective financial management, collaboration with vulnerable populations and well-defined planning for community recovery. Just as the World Health Organization should take this opportunity to consider how to coordinate responses to global threats more quickly and effectively, our federal government system, in conjunction with groups like NACCHO, must give serious policy attention to public health planning, preparedness and response to deal with existing and emerging threats. Author: Nathan Myers is an assistant professor of Political Science at Indiana State University. He primarily teaches courses in the Master of Public Administration program. Myers is also a member of the ISU Center for Genomic Advocacy. His teaching and research interests include organizational behavior, public health policy and biotechnology policy associated with genomic research. It is apparent that there are not nearly enough public health officials with public administration training; and, not enough public administrators with public health training. There are too few educational programs that attempt to cross train an essential cadre of a new generation of professionals who can do both. Dr. Michael W. Popejoy, Ph.D., M.P.H.